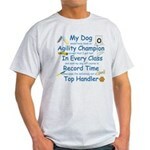 Great agility, herding and dog sports wearables and more. The joys of agility, herding, and friends, plus a bit of philosophy comes with a smile on these shirts, mugs and other things. Dogs having fun is our theme. This special "Just Ask My Dog" line shows you as a team. You and your dog agree on the message, but YOUR shirt also advises "Just ask My Dog"? It's fun, it brings grins. I should know, I've been wearing them. And if you want to know more about wonderful activities you can share with your dog, just visit the DogPlay home page. Get lots of smiles! The front of the people shirts comments on a dog sport, the back says "Just Ask My Dog". And there are matching dog tshirts too. More products with this image. Visit all the "Just Ask My Dog" Tsuki Says shops.